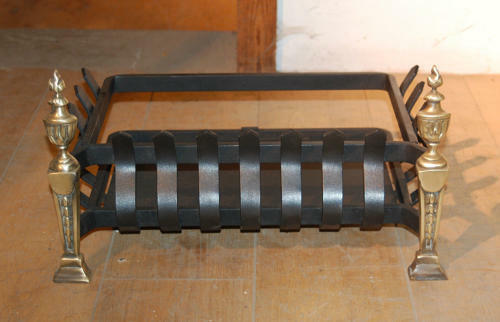 A lovely, petite, cast iron fire basket with attractive brass legs. The stool has great design with curved spike detail on three sides and an open back. The brass legs are in an Adams style and are an attractive addition to the basket. The fire stool is reclaimed but is fairly new and in very good condition and ready for use. The colour is good and there is little sign of use and wear. There is some slight surface rust to the base of the basket and the brass has slight tarnishing. A very pretty item that work perfectly in a small fireplace. The items fine quality and design would fit well with most interiors and provide style and character.